Ball State University Epsilon Mu Chapter Fall 2018 THE IRIS Summer Renovations Complete Excitement Builds as We Continue to Renovate Without Taking on Debt W e are excited to announce the completion of many renovation projects from this summer. After the house corporation board approved the renovations, we got right to work. Funding for the shelter projects comes from the approximately $50,000 per year the HCB diligently sets aside, set aside from rent revenue. None of these projects were funded from campaign donations. COMPLETED SUMMER 2018 • First floor bathroom o New tile floor, showers, toilets and urinals, and a new coat of paint. • Kitchen o New ceiling, counters and sink. • Basketball court o New 72" basketball hoop. o Court branded in Delta Tau Delta colors. • Outdoor fence o Replaced along the east side. o New fence along Beechwood Ave. FUTURE PROJECTS • Second floor bathroom o Complete remodel. • Kitchen o New ice machine. • Outdoor fence o New fence around dumpster. We have zero debt and will not use any campaign money for anything other than an addition to break bread as brothers. This was the wish of John Fisher '90 and I share that vision. Thank you, brothers, for your ongoing support of Delta Tau Delta Fraternity at Ball State University. Fraternally, Jeff Hern '92 Epsilon Mu, House Corporation Board jeffhern@aol.com Meet Our New Chapter Advisor Q&A with Ken Glass, Beta Alpha '76 I ndiana University and Delta Tau Delta alumnus, Ken Glass, Beta Alpha '76, was appointed to serve as a chapter advisor for Epsilon Mu in March of 2018. With a decades-long history of representing and guiding the fraternity in various leadership capacities, his experience is both extensive and extraordinary. To learn more about Ken, continue reading below. Q: Why did you join Delta Tau Delta? Ken Glass, Beta Alpha '76: I was referred to ΔΤΔ at Indiana University by my best friend's father and visited in February during my senior year of high school. The members were cordial and accepting of my idiosyncrasies (of which there are many). Q: Did you hold any executive offices an undergraduate? Ken: I served as Beta Alpha's vice president, guide, recruitment chairman, alumni chairman, and new member education chairman. 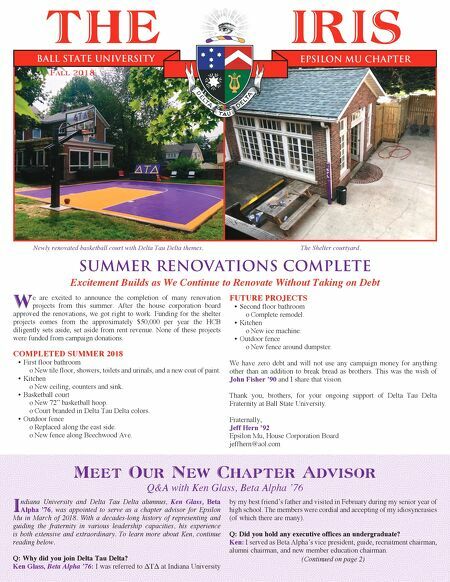 (Continued on page 2) Newly renovated basketball court with Delta Tau Delta themes. The Shelter courtyard.